I figured it was time to put an animal on the Modern Hobbit and what better than the good ole' Brown Anole (Anolis sagrei). 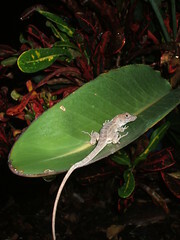 The Brown Anole is not native to the United States, but has become well established in South Florida. They more than likely migrated via cargo ships importing fruits and veggies from South America. This fellow (probably a female) and a thousand more like it was photographed in my backyard sunning itself on a broad leaf. The brown anole varies in coloration ranging from all browns, to creams, some have stripes, chevrons and triangles along the back. We often watch them clean up the yard of insects including ants, roaches and any other small insect that crosses their path. Harmless and fun to watch, we enjoy their bravado and welcome them.